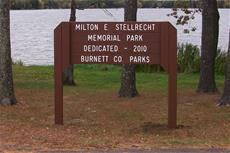 Milton E. Stellrecht Park is located at 6670 State Road 70, in Meenon Township on the north side of Hwy 70 between Clam Lake and Lower Clam Lake next to the DNR boat landing. Facilities include a restroom, pavilion, grills, water fountain, fishing pier and picnic tables. Burnett County Parks are DAY USE only and cannot be reserved. They are on a first-come/first-served basis with no user fees.